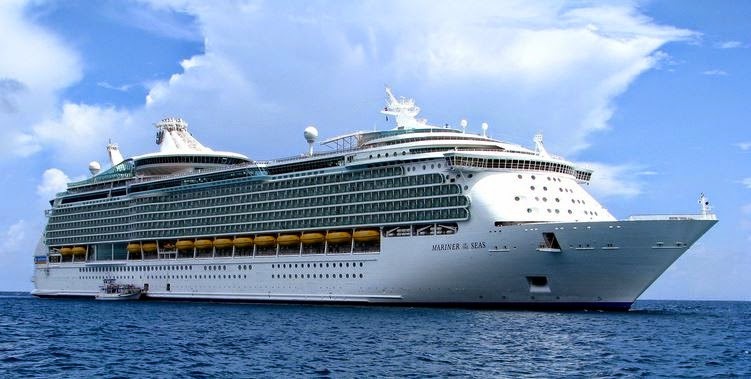 All Aboard the Royal Caribbean: Mariner of the Seas! I've been contemplating how to do this blog post. As this was the most 'relaxing' time of the holiday I wasn't always taking photos -however, I did film a lot and it am trying to put it into a video so please stay posted for that- but I'll dedicate this post to the time on the ship. It was astounding, the ship was absolutely stunning and it was hard to believe that all of it was floating. 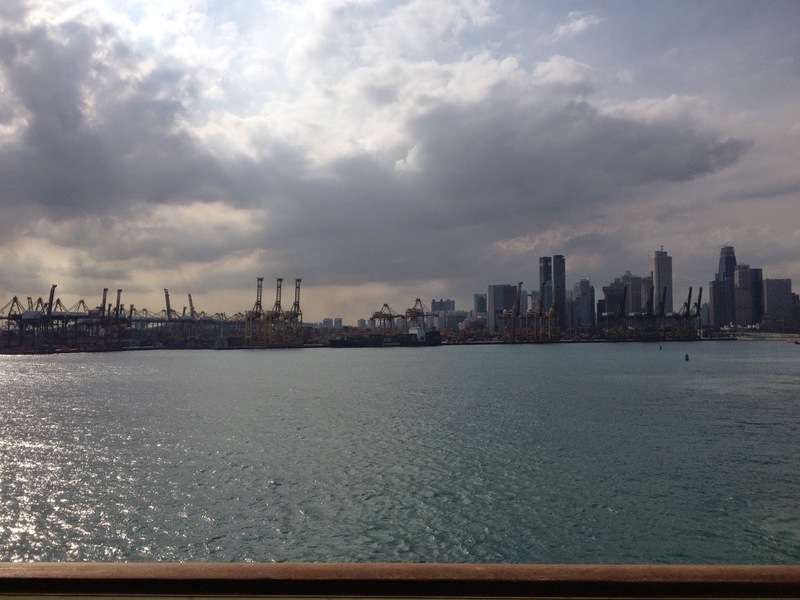 With Singapore (and hopefully the humidity) behind us it was time to sit back and relax and live the lavish life of what I like to call 'A Cruiser'. No this is not a sugary vodka premix drink that 15 year olds drink. This is someone who enjoys being waited on hand and foot and likes to spend lush amounts of money at the bar drinking cocktails and discussing all the travel they've done in their life. Our ship was 'The Mariner of the Seas' and I cant say that without thinking of it being said in a generic American accent. That aside, the ship was gorgeous. I honestly can't even explain it all so if you're interested in it, give it a quick google search and prepare to be amazed. Here she is in all her glory. It looks impressive from the outside but just wait until you see inside. There are two separate pool areas. One more for families and young children and the other you have to be 16+, not because it is more difficult, but its a place where you can relax without screaming children. It was also more private. Our room was on deck 6 and it was one of the rooms with a little balcony which was quite nice. Kris sat out there and read a lot. The view from the bed out to the balcony. Kris reading and open water. The first afternoon / evening on the ship we mainly explored and I tried to get my head around what direction was what. I got so confused wether I was heading to the front or back of the ship and what side I was on. At least the elevators had what day of the week it was so, I can be thankful for that. We were now able to go and check out our rooms. Ours was really easy to get to from where we were sitting at the cafe, the cafe was the floor below us. Once putting the rest of our luggage in our room we decided to find where the 'lunch room' was. This place is basically a buffet from 06:00 to 10:30 for breakfast 11:30 - 16:30 for lunch and then 18:00 - 21:00 for dinner and then opened up later for 'late night snacks'. It had a whole heap of different foods, a huge Asian selection, an Indian selection, and a large Western selection. It was heavenly. 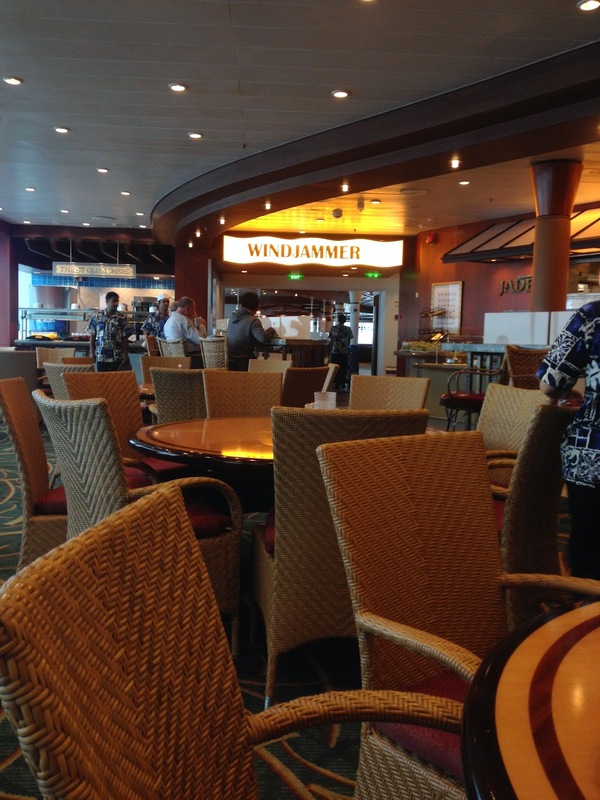 The place was called 'The Windjammer' Cafe. Kris and I kept reading it in a German accent and calling it the 'Vind-yammah'. This became a long running joke throughout the whole cruise. We bumped into mum and Lindsay up there having lunch and we made plans to meet back here for lunch at 18:00ish..
We were hanging out in our room when a voice over alerted us that we would have a practice emergency drill. So that happened, there were different check out points to go to, ours (Kris' and mine) was A03 which turned out to be the Lotus Lounge. We now went to wander and explore the ship some more and on our way out of our room we were introduced to our (what I liked to call) Room Nanny. This guy was basically in charge of our section of the deck and if we needed something we were to contact him and he'd go out and get it. It was pretty good, but I wasn't used to having someone run down the hallway for me just to open my door when I was already standing at it, so at times it got a bit annoying. My bag had just been delivered and Kris' had not so we were wondering where it was. Nevertheless we set out to see just how much grander this ship had. When we came back to the room we were informed that Kris' bag had been taken down to security. We got a little lost on our way there but we soon found the room to find that there were a heap of other people coming and going so I didn't feel so much like a criminal. I saw that someones iron had been confiscated so I was a lot more at ease. It turned out that we weren't allowed to use our power board and a heap of other people had theirs taken as well. We would get it returned to us on our way off the boat, it was all catalogued and stored away safely so that was nice. We think that it is because they don't want to overload the circuits with a power serge or something like that. FOOD TIME! We met up with Mum and Lindsay in the 'Vind-yammah- for dinner and then discussed what we'd do afterwards, everyone is given a 'daily planner' thing with everything that is offered on board for that day, we saw that there was: Karaoke at 20:15 on Deck 3 in the Dragons Lair so we decided we'd go to that after dinner to see what it was like. It was pretty cool, there was another group of Australians there having a go and some other too. 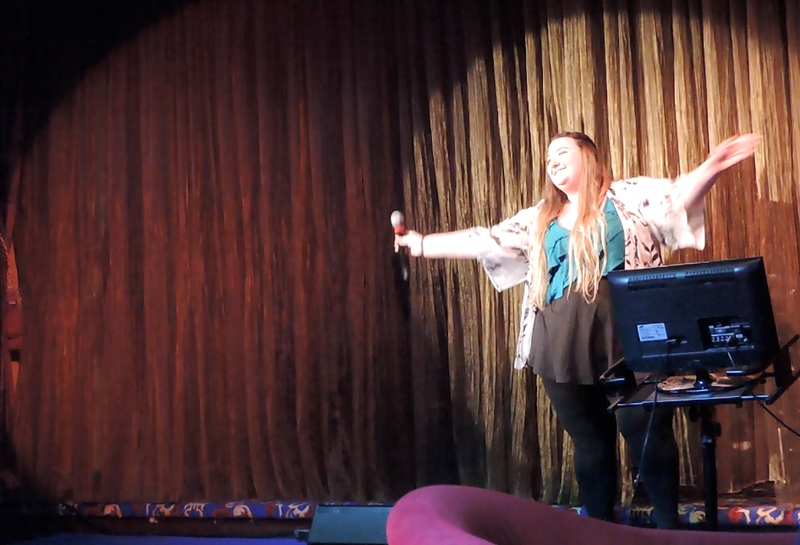 I got up and sang one song (I was nervous as hell) I sang Lady Marmalade by Christina Aguilera, Lil' Kim, Mya and P!nk. It was really fun and I've never sung in front of my mum before (except for choir) so that was nice (we went back to karaoke on the second night with our whole group and I sang again, this time I did 'All That Jazz from Chicago and I got asked to be in the finals on the last night - that was exciting and terrifying). 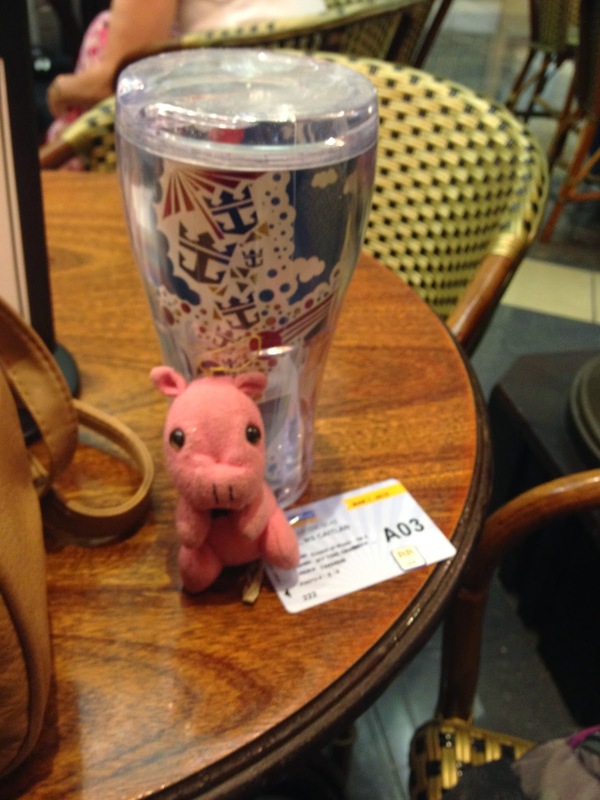 After that we wandered around the ship some more before heading to the cafe and having a drink and snack. By the end of it, it was about 22:30 so we decided to go to back to our rooms (mums room is on the other end of the ship) and chill out and we'd meet up for breakfast in the Vind-yammah in the morning. That was Day One and the rest of the days basically went like that. Breakfast in the Vind-yammah then the whole day doing activities on the ship and then dinner at the restaurant. The restaurant was apart of our booking package. It was basically a free silver service restaurant. Our two waiters were lovely and we had heaps of little jokes with them each night. The food here was exquisite, obviously not the buffet style we have breakfast and (most times) lunch at. Every night there is a new menu and the food is so delicious and the best part is that we didn't have to pay for it, it was all included in our package. YAY! The first time we ate here though was on the second night. Kris and I didn't read that it was one of the 'Formal' nights so we felt a little under dressed but there were quite a few other people who obviously didn't get the memo and that made me feel better. This is what I ate on the first night. Starter, Entree, Main and Dessert. Top Left: Bay Scallop Gratin; Melted garlic-herb butter and olive breadstick. 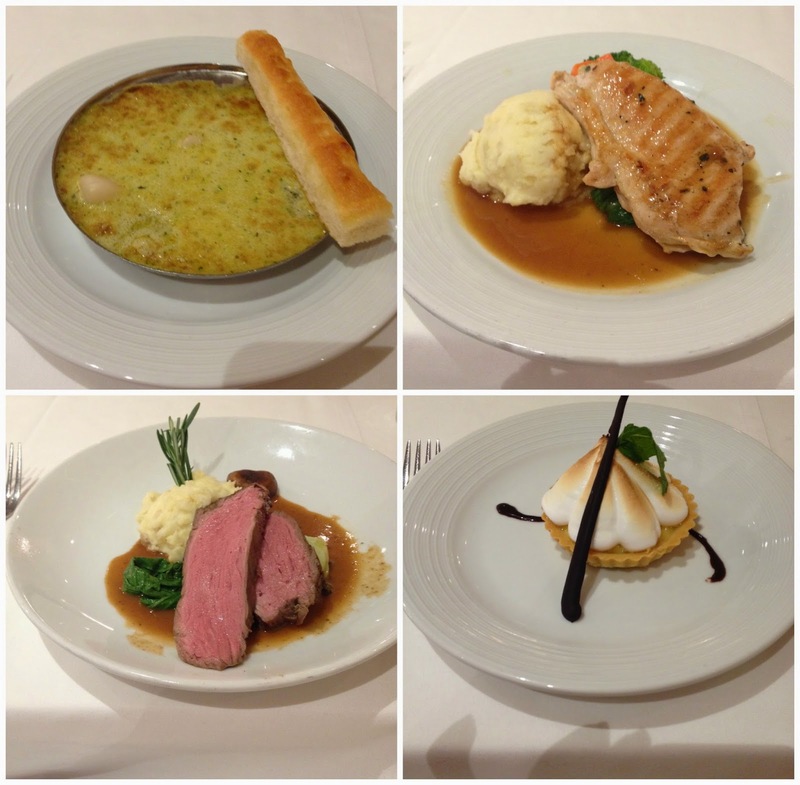 Top Right: Chicken Breast with Seasonal Herbs; Grilled breast of chicken with rosemary, served with assorted vegetables. Bottom Left: Carved Filet of Beef Tenderloin; Morel-crimini mushroom sauce and creamy whipped potatoes. Bottom Right: Lemon Meringue Tart; Individual tart with lemon curd and perfect soft meringue. Now, I'm not one to usually take photos of my food, and I felt a little strange doing it in a place so beautiful as this, but I had to, and obviously I didn't do it every night but the first night I did and this is what I ate. Everything was cooked to perfection. I am sad to have to come home and cook for myself now. Cruise life is great, there are always activities offered on board, such as shows, talks, classes being held, demonstrations, movies, events and more. I went to as many as I could but also made sure I relaxed by the pool because it was so lovely, and also, FREE FROZEN YOGURT! What more could you want out of life. We spent the next few days enjoying what was on offer. The ship had docked in Vietnam but Kris and I decided to stay on board. I kind of felt a little bit regretty because I felt like I should get off the ship and see everything, but we had a really good day on board, when we met up with mum and Lindsay (who went into Vietnam) they said that the tour was alright but we didn't really miss anything, that made me feel so much better. Kris and I played mini golf on the top deck of the ship and got an awesome view of the area we were in, in Vietnam. We spent the day by the pool and then hung out in one of the bars later that night. The ship was amazing. It is hard to believe that so much could fit. One of the nights we went to see a show in one of the theatres. It was a magician doing some slight of hand tricks and at the end he was suspended in the air and escaped from a straight jacket, the guy was australian and it was a really cool show. He made some jokes, pulled people up from the audience and everyone seemed to enjoy it. When we got back to our room that night there was a little pig on our bed. The people who make up our rooms at night leave little animals made out of towels on the bed. Its so cute, there is a course held on one of the days that teaches you how to make some of the animals and me, Kris, mum and Lindsay went to it. We learnt how to make so many things, make sure you watch the vlog to see that. We also went to some napkin folding classes, the one below is the Sydney Opera House. I made that and I'm so proud of it. I feel like I need to go out and buy some linen napkins and have extravagant dinner parties just to show off my skills in napkin folding. When I'm putting it in writing it doesn't seem like we did much, and to be honest it doesn't matter if we did or didn't because even just being on the ship was doing something, though every day we did do 3 - 5 activities plus down time and three meals. The next stop off was Hong Kong and we did get off the ship here to spend the day exploring. To read that Click Here. We were at sea for another day and then stopped off in Xiao Man, it didn't matter if you were staying on the ship or not, everyone had to get off at some point of the day and get checked by Chinese Customs. We didn't have any tours booked, but went off and went through the immigration anyway (as we had to) we wandered through the docks and took a few photos. This was the first real taste of "no english" I encountered. Even in Hong Kong some signs were still written in English along with the characters. The only English I saw was underneath the characters and that was telling us which entrance was ours to return to the boat. It was a lovely and sunny day in Xiao Man not rainy like Hong Kong but certainly on the cooler side. The buildings glistened in the sun and you could hear the hustle and bustle from the nearby markets. I would have liked to go to the markets but we didn't have any Chinese currency. Mum and Lindsay went though and they picked up a few little things. I spent the afternoon at the pool. As it was colder, I was definitely more keen for the hot tub than the pool. I loved the atmosphere by the pool, there are so many people of so many different walks of life and different shapes and sizes and not one of them had any fucks to give about their 'bikini body'. It was a place that made me feel at comfort rather than making me want to sit in a dark corner and hide my shame. The last few days from Xiao Man to Shanghai were pretty easy. Mum and I went to a heap of the classes, I took some Mandarin lessons (its difficult) and we even saw an ice show, yep on board along with all the other cool bits and pieces there is an ice arena. We saw the show and it was spectacular. We were in the front row and I had a grin across my face the whole time. The show was called "Ice Under the Big Top" (circus themed) and it was fantastic. It makes me want to go see more ice shows because the amount of talent these people have is phenomenal. There was a scene? skit? whatever they call it, it was like the scene from Moulin Rouge the 'Spectacular Spectacular' scene and it was great. Mum and I were super excited. After one of the big scenes a girl came out and then they lowered a hoop down and she did a gymnastic performance full of lifts and swirls and amazing spinning on the ice. She would be spinning so fast on the ice and then the hoop would lift her into the air and she'd still be spinning. It was so beautiful because there were only a few spotlights on her and the music was so peaceful. They did other stunts in the air wherein which large ropes would drop down and the girls would climb them and then some of the guys would spin them around. I kept thinking to myself "I hope their skates are on tight" I just kept panicking that someone would lose a body part. It seemed like there were some close calls and some near misses but these guys are professionals I'm sure they knew what they were doing. To fit in the theme of 'Under the Big Top' they had a scene where they were all clowns and they came racing in and out of the audience and everyone got involved. It was truly one of the most amazing things I've ever seen. One thing that annoyed me though, while yes I was taking pictures I was also clapping and cheering when stunts were done. People seemed to be too involved in trying to get the perfect shot they didn't bother giving credit to the performance that was going on right before their eyes. After every flip, twist and spin I was clapping and wooing and in utter amazement (as were other people, don't get me wrong) but there were so many others who had their iPads up in front of their face or something like that just not giving the performers what they deserve. It was quite sad to see really, but I cheered and yelled whenever I could and I always got the bigger smiles and winks from the performers and that made me happy (mum and I even got some high fives from one of the guys). It was coming down to the last few nights on board. There was another 'formal dinner' event in which yes, we did get the memo. 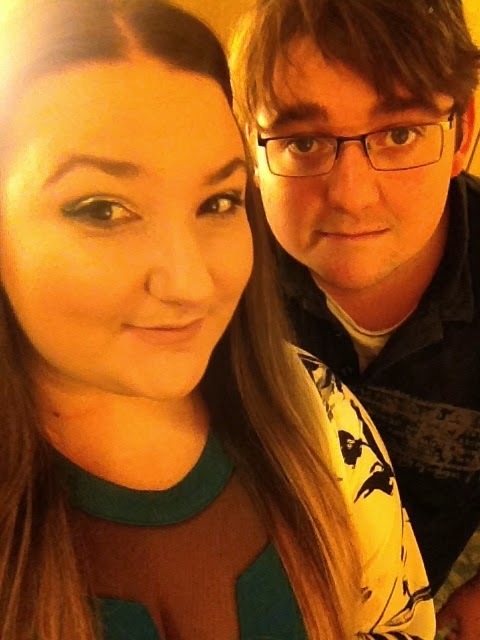 It was nice to dress up and put some effort into our appearance. We all had dinner as a group. All ten of us. Me, Kris, Mum and Lindsay, Sue and Steve, Roz and Drew and Zelma and Max. It was nice eating dinner with a big group, but I did miss our table staff. 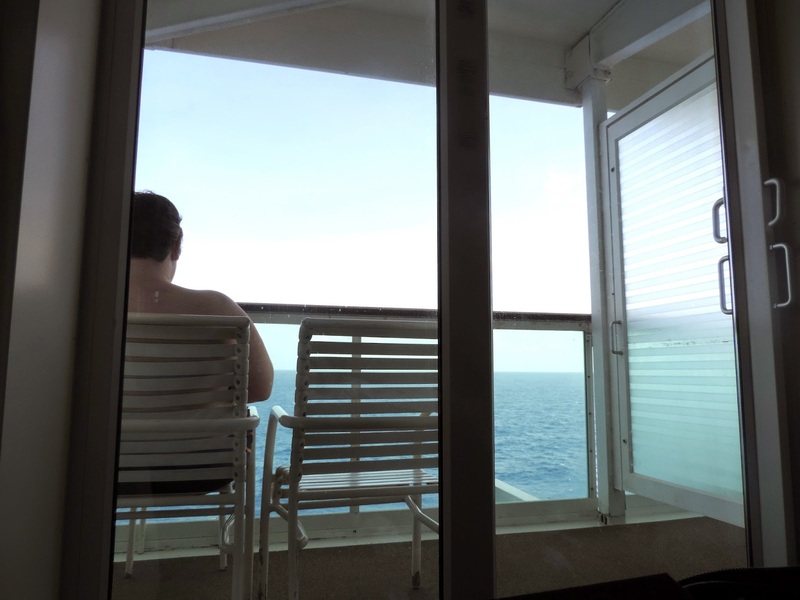 Our last night on board had me with mixed emotions. I love the 'cruise life' and the people on board are lovely however I was really excited to experience Shanghai, and I was a little bit ready to be home - not that I was wishing my time away, that is the worst thing you can do on holiday / while you're traveling. I was just excited for new things but really happy to stay on the ship with the amazing people I've met. We had dinner at our usual table and it was delicious, as always. 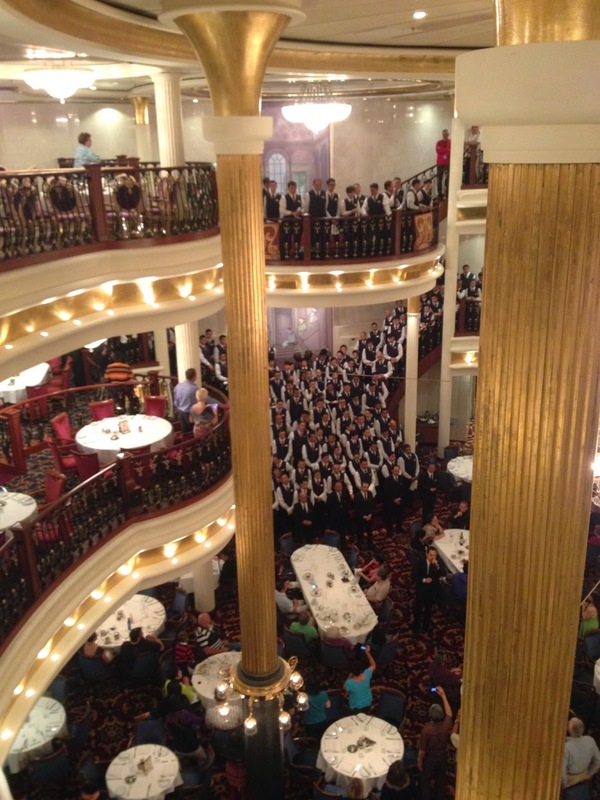 When we arrived in the dining room there was a speech happening, all of the wait staff were on the staircase they'd just finished singing a song and they were thanking everyone for a lovely time etc, it was really nice. Its hard to see them all (and some weren't there as they were waiting tables etc) as the columns block out some of the view. The dinner guests all came up to the railing to hear the speech and the song. 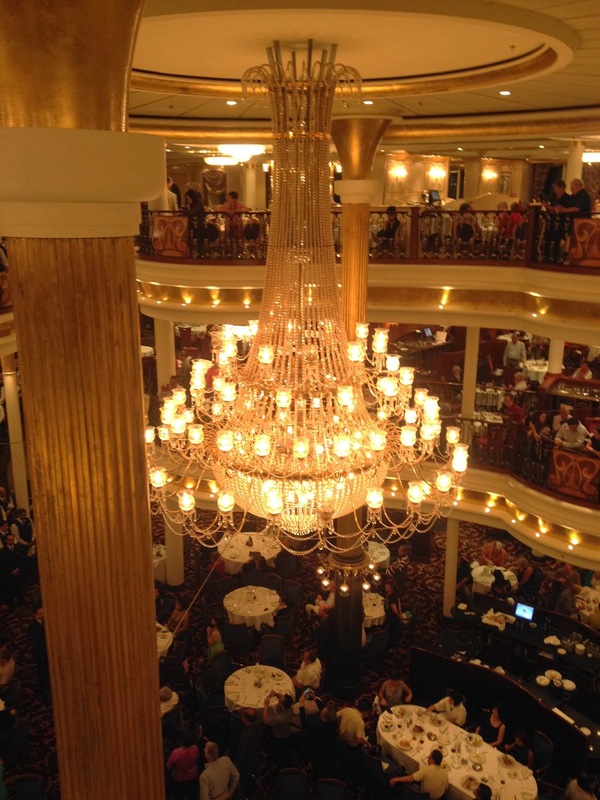 Huge chandelier and all three levels of dining rooms. This is the dining room we ate in every night. We were on the top level, this one was called 'The Sound of Music', the middle level (which I didn't go in) was 'Top and Tails' and the bottom level was 'Rhapsody and Blues' (or something similar). They were all colour themed differently, but all united by the grand chandelier and winding staircase that went through all three levels. The Rhapsody, was a dark royal/navy blue and white theme. It was lovely in there, we ate lunch there one of the days. Top and Tails was red and gold themed and The Sound of Music which to be honest was my favourite was purple and white themed. The chairs were white/cream wood with purple velvet cushions. It was just so fancy and nice. It had golden accents and beautiful columns. I was actually a little upset to have to say goodbye to these two. To the left is Lu and the right is Anwar. They were our waiters. 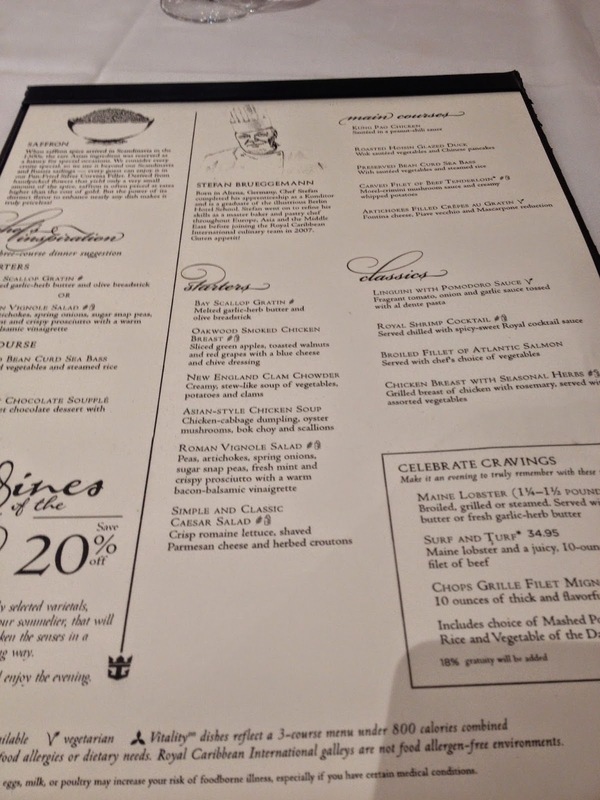 They joked with us the entire time we were on board and made our dining experience exceptional. Mum and I were 'showing off' with our napkin folding skills and that caught the attention of Lu, so he grabbed one of the napkins and made a tiny little boot, it looked like an elf shoe (it will be in the video) and then he made a little baby swan and drew eyes and a little tuft of hair on it and gave it to me. It may seem like something silly but it was actually so nice. I took them both home with me and they're sitting proudly in my dining room. When we got back to our room, we found this on our bed. This is Moe (see Singapore blogs for his origin story). 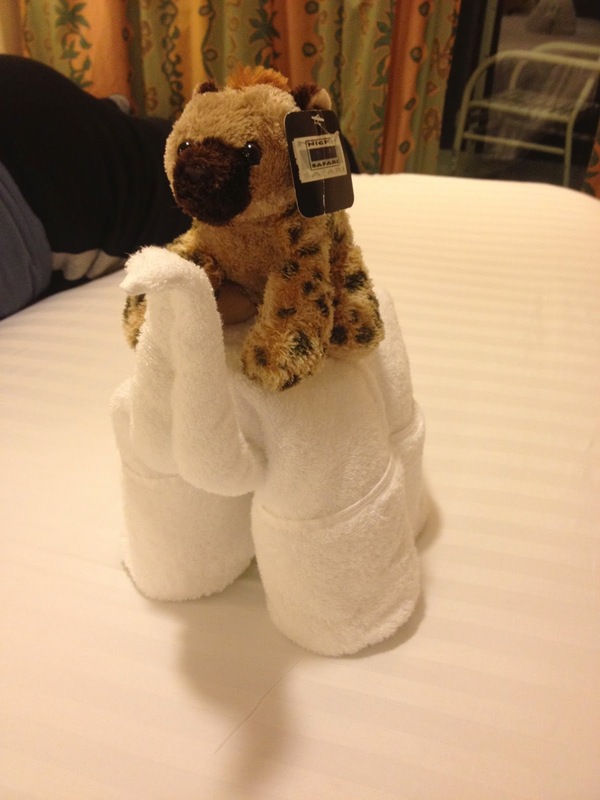 The night staff had made a brontosaurus out of towels and placed Moe on top and put it in the middle of the bed. This makes me want to set up a guest room and have people over all the time so I can impress them with my towel folding and napkin skills. We had an early start yet again in the morning, and with that I leave it here. I'll be dedicating another blog post to the time in Shanghai. Thanks for reading.